My mother says that, as a child, I could – and did – fall asleep anywhere. Once while shopping downtown, she stopped to chat with an acquaintance for a few minutes. When she was ready to move on with our errands, she looked around for me – and discovered me, sound asleep, on the sidewalk. I wish sleep came as easily now. Oh, I can still fall asleep (sometimes) with the rapidity and grace of a fainting goat. But the depth and duration of my sleep is often not impressive. I am becoming more well acquainted with the hours between 2 and 5 a.m. than I ever wished. On my good nights, I sleep for a couple of hours before waking up. On the bad nights, I am keenly aware of each tick of the clock. My thoughts have been casting a shadow on the moon of my heart. Some nights the shadow looks suspiciously like Donald Trump, or the clashing of angry crowds, or a family waiting to be rescued from their roof. Sometimes it is just a blobby shadow with no distinctive shape. I think and I worry about politics, about what is happening to the earth, about all of us. 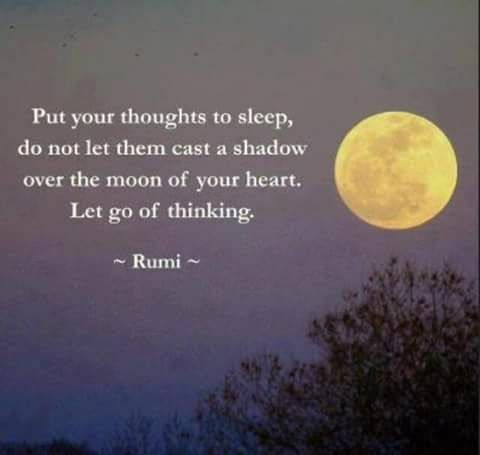 I must remember how to let go of thinking.